We had a bountiful pear harvest this year. This season is the first one that yielded a significant number of pears from the pear trees (Bartletts, two of them). The first year, there was nothing and the trees had to be dug up and rotated as they were planted improperly. The second year, we got pears on one of the trees but someone stole them! This year, the trees were heavy-laden with pears. One of the trees had fewer, fatter pears. The other tree had more pears, but they were generally smaller. We canned most of them already, but we saved some of the baby pears for eating. 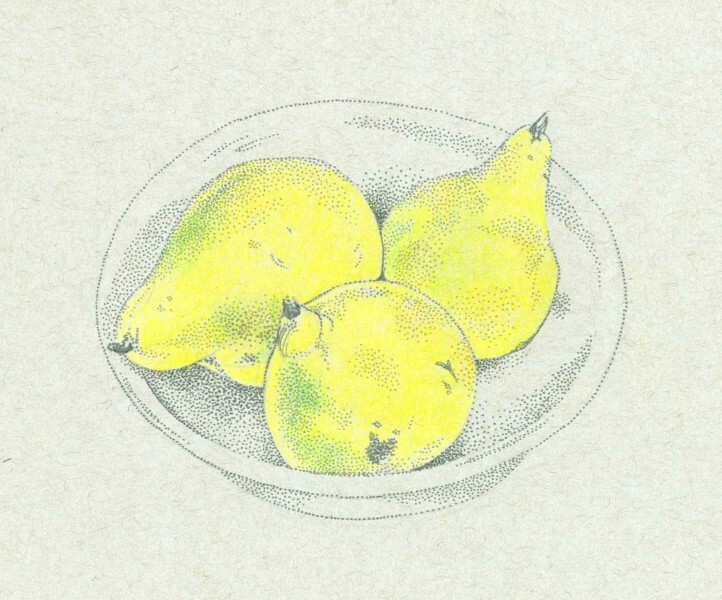 ©2015 Carolyn A Pappas, Pears in a Bowl (10-1-2015). Ink and colored pencil in 8.5 x 11 inch gray toned sketchbook.